This chapter describes how Kaṁsa, following the advice of his demoniac friends, considered the persecution of small children to be very diplomatic. According to the prophecy, the eighth child of Devakī would kill Kaṁsa, and therefore when Kaṁsa saw that the eighth child was a female and heard that his so-called enemy had taken birth elsewhere, he was struck with wonder. He decided to release Devakī and Vasudeva, and he admitted before them the wrongness of his atrocities. Falling at the feet of Devakī and Vasudeva, he begged their pardon and tried to convince them that because the events that had taken place were destined to happen, they should not be unhappy for his having killed so many of their children. Devakī and Vasudeva, being naturally very pious, immediately excused Kaṁsa for his atrocities, and Kaṁsa, after seeing that his sister and brother-in-law were happy, returned to his home. After the night passed, however, Kaṁsa called for his ministers and informed them of all that had happened. The ministers, who were all demons, advised Kaṁsa that because his enemy had already taken birth somewhere else, all the children born within the past ten days in the villages within Kaṁsa’s kingdom should be killed. Although the demigods always feared Kaṁsa, they should not be treated leniently; since they were enemies, Kaṁsa should try his best to uproot their existence. The demoniac ministers further advised that Kaṁsa and the demons continue their enmity toward Viṣṇu because Viṣṇu is the original person among all the demigods. The brāhmaṇas, the cows, the Vedas, austerity, truthfulness, control of the senses and mind, faithfulness and mercy are among the different parts of the body of Viṣṇu, who is the origin of all the demigods, including Lord Brahmā and Lord Śiva. Therefore, the ministers advised, the demigods, the saintly persons, the cows and the brāhmaṇas should be systematically persecuted. Strongly advised in this way by his friends, the demoniac ministers, Kaṁsa approved of their instructions and considered it beneficial to be envious of the brāhmaṇas. Following Kaṁsa’s orders, therefore, the demons began committing their atrocities all over Vrajabhūmi. Syamasundara: How does modern society differ from the Vedic ideal? Srila Prabhupada: Now there is large-scale industrialization, which means exploitation of one man by another. Such industry was unknown in Vedic civilization it was unnecessary. In addition, modern civilization has taken to slaughtering and eating animals, which is barbarous. It is not even human. In Vedic civilization, when a person was unfit to rule he was deposed. For instance, King Vena proved to be an unfit king. He was simply interested in hunting. Of course, ksatriyas are allowed to hunt, but not whimsically. They are not allowed to kill many birds and beasts unnecessarily, as King Vena was doing and as people do today. At that time the intelligent brahmanas objected and immediately killed him with a curse. Formerly, the brahmanas had so much power that they could kill simply by cursing; weapons were unnecessary. namaù—obeisances; mahä-vadänyäya—who is most munificent and charitably disposed; kåñëa-prema—love of Kåñëa; pradäya—who can give; te—unto You; kåñëäya—the original Personality of Godhead; kåñëa-caitanya-nämne—under the name Kåñëa Caitanya; gaura-tviñe— whose complexion is the golden complexion of Çrématé Rädhäräëé; namaù—obeisances. O most munificent incarnation! You are Kåñëa Himself appearing as Çré Kåñëa Caitanya Mahäprabhu. You have assumed the golden color of Çrématé Rädhäräëé, and You are widely distributing pure love of Kåñëa. We offer our respectful obeisances unto You. conflagration that cannot be extinguished by any means other than the congregational chanting of Krsna’s holy name. birth and death. This the root cause of the threefold miseries. The Blessed Lord said: There is a banyan tree which has its roots upward and its branches down and whose leaves are the Vedic hymns. One who knows this tree is the knower of the Vedas. The real form of this tree cannot be perceived in this world. No one can understand where it ends, where it begins, or where its foundation is. But with determination one must cut down this tree with the weapon of detachment. So doing, one must seek that place from which, having once gone, one never returns, and there surrender to that Supreme Personality of Godhead from whom everything has began and in whom everything is abiding since time immemorial. In Social Systems Theory bifurcation means branching. In the Vedas the term anga means branch. This process is also called a phase transformation. According to Prigogine and Stengers (1984), this fluctuation or singular moment or bifurcation is inherently impossible to predict as to whether the transition will be towards higher states of order or disintegrate into chaos. Hence, the system may be reacting to external, internal, vertical, and horizontal pressures as it attempts to survive. Transitions are weak links in a system whether it is an organism or level of human organization. One can observe that a baby calf or deer may have only seconds or minutes to get it’s legs after birth to avoid the wild predators that are only meters away. Gaudiya Vaishnavism has a very long lineage. It has been nearly extinct several times as previously to the time when Krishna spoke the Bhagavad Gita to Arjuna. There has been many angas or branches since Bhaktivinoda revived Gaudiya Vaishnavism just over 100 years past. One may observe the different camps diksa – ritvik, and mathas as the Caitanya Nsringha and IPBSYS or Pure Bhakti. There are several lines operating under what is diksa ISKCON currently. 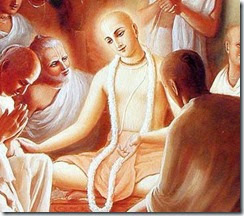 Çréla Rüpa Gosvämé states that his elder brother (Sanätana Gosvämé) has compiled Hari-bhakti-viläsa for the guidance of the Vaiñëavas and therein has mentioned many rules and regulations to be followed by the Vaiñëavas. Some of them are very important and prominent, and he will now mention these very important items for our benefit. The purport of this statement is that Çréla Rüpa Gosvämé proposes to mention only basic principles, not details. For example, a basic principle is that one has to accept a spiritual master. Exactly how one follows the instructions of his spiritual master is considered a detail. For example, if one is following the instruction of his spiritual master and that instruction is different from the instructions of another spiritual master, this is called detailed information. But the basic principle of acceptance of a spiritual master is good everywhere, although the details may be different. Çréla Rüpa Gosvämé does not wish to enter into details here, but wants to place before us only the principles. 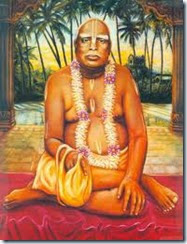 He mentions the basic principles as follows: 1) accepting the shelter of the lotus feet of a bona fide spiritual master, 2) becoming initiated by the spiritual master and learning how to discharge devotional service from him, 3) obeying the orders of the spiritual master with faith and devotion, 4) following in the footsteps of great äcäryas (teachers) under the direction of the spiritual master, 5) inquiring from the spiritual master how to advance in Kåñëa consciousness, 6) being prepared to give up anything material for the satisfaction of the Supreme Personality of Godhead, Çré Kåñëa (This means that when we are engaged in the devotional service of Kåñëa, we must be prepared to give up something which we may not like to give up, and also we have to accept something which we may not like to accept. ), 7) residing in a sacred place of pilgrimage like Dvärakä or Våndävana, 8) dealing with the material world only as far as necessary, 9) observing the fasting day on Ekädaçé, and 10) worshiping sacred trees like the banyan tree. These ten items are preliminary necessities for beginning the discharge of devotional service in regulative principles. In the beginning, if a neophyte devotee observes the above-mentioned ten principles, surely he will quickly make good advancement in Kåñëa consciousness.